GREAT QUALITY (8 BEST COLORS) - Our dual-layer sports mouth guards give you the best customized fit (Inner Gel Layer) and the most superior impact resistance (Outer Impact layer). Not all dual-layer mouth guards are the same and our materials are different. We spend years of testing to finalize the design and material which are tailored to professional athletes or your youth future superstar. You may not be able to tell the difference by appearance until you try it. Comes with FREE case. ULTIMATE CUSTOMER SERVICE - After you receive your youth mouthguard, our sales manager will send you an email to follow up with step by step instruction, which is also on the back of the package. 100% Customer Satisfaction is our goal and we literally read all feedback, which helps us to keep improving our mouth guards to make each and every of our customers 100% satisfied. BPA-FREE - High-quality BPA-Free strapless silicon mouth guard. Your safety is our ultimate goal. BPA Free! Latex Free! Phthalate Free! We Passed all Safety Test.100% Medical-Grade Materials. Super easy to follow and the adult & youth mouth guards give you maximum protection for flag football, karate, lacrosse, hockey, football, field hockey, rugby, roller derby, martial arts, MMA, boxing, sparring, BJJ, wrestling and other contact sports. 100% MONEY BACK GUARANTEE - Size Problem? Unlike shoes, there are only 2 sizes (Adult & Junior) for boil and bite mouth guards, which fit most ("NOT" all) of the customers. Some advanced customers know how to trim the mouth guards if they are too big. If you are a new mouth guard user, please make sure you buy the right size, follow the instruction, and we will take the responsibility if they don't fit. What Oral Mart "CUSHION" Sports Kids Mouth Guard / Gum Shield for Kids/Adults? The American Dental Association recommends wearing sports mouthpieces for the following sports: acrobats, basketball, boxing, MMA, UFC, field hockey, ice hockey, football, gymnastics, handball, ice hockey, lacrosse, mixed martial arts, racquetball, roller hockey, rugby, shot putting, skateboarding, skiing, skydiving, soccer, squash, surfing, volleyball, water polo, weightlifting,Brazilian jiu-jitsu, BJJ,Muay Thai and wrestling. Other experts include baseball and softball infielders on that list. They further recommend the mouthguard to be worn during all practices and competition. 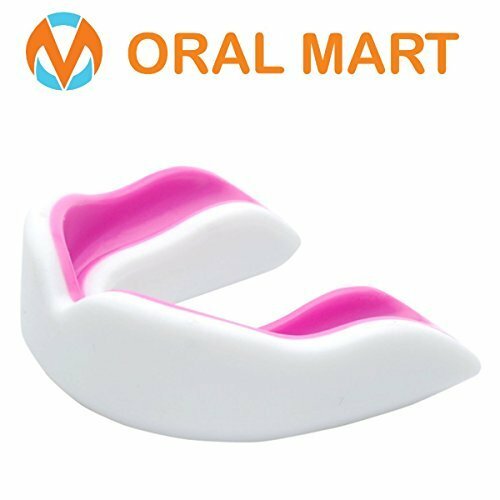 Why Oral Mart Pink Mouth Guards? Your Safety is Our Priority. BPA Free! Latex Free! Phthalate Free! We Passed all Safety Test.100% Medical-Grade Materials. All of our mouth guards are safe for adults and kids and they are absolutely BPA Free. While some mouth guards may look similar, what it really matters is the material. Maximum Protection Custom Fit Strapless Boil and Bite Sports Mouth Guards / Gum Shields for Contact Sports like Rugby Football, NFL Ice Hockey, Brazilian Jiu Jitsu, Boxing, NBA & College Basketball, Mixed Martial Arts (MMA), UFC Ultimate Fighter, Wrestling, Lacrosse.